The Gay Gamer: Did you know that Japanese Game Gear boxes are about the same size as WonderSwan boxes? 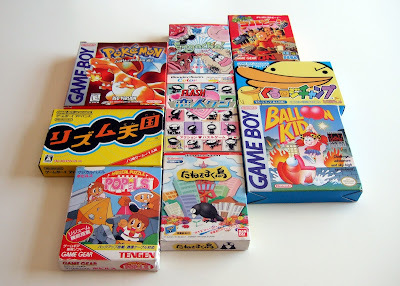 Did you know that Japanese Game Gear boxes are about the same size as WonderSwan boxes? Well, you do now--courtesy of the following pair of photos that I recently snapped with my trusty digital camera. 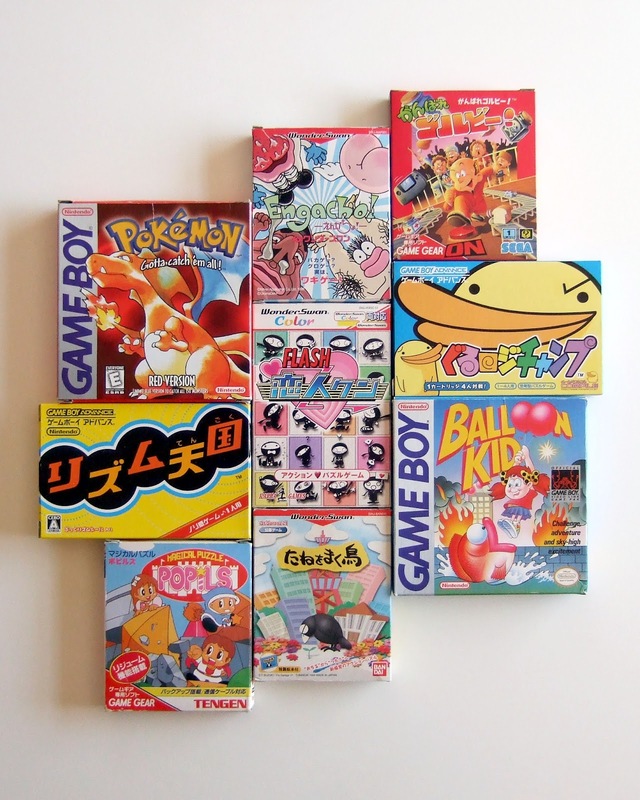 For those who are curious, the games included in these photos are (clockwise from the upper-left): Pokémon Red (GameBoy), Engacho! (WonderSwan), Ganbare Gorby! (Game Gear), Guru Logi Champ (GameBoy Advance), Balloon Kid (GameBoy), Tane wo Maku Tori (WonderSwan), Magical Puzzle Popils (Game Gear), Rhythm Tengoku (GameBoy Advance) and Flash Koibitokun (WonderSwan Color). I decided to take these photos when I discovered that the boxes that house Game Gear games are nearly the same size as those that house WonderSwan games. 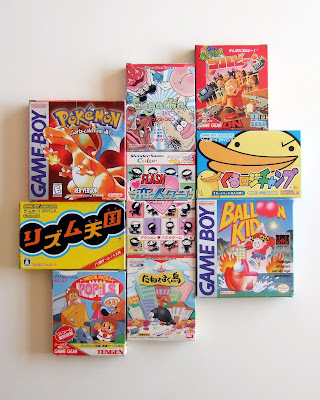 Also, I thought some of you might like to see how those boxes compare in size to the boxes of other portable gaming systems, like the GameBoy and the GameBoy Advance. I'm planning to take more photos like the ones above (and these) in the coming months as I continue to acquire additional 3DS, DS, GameBoy, Game Gear and WonderSwan titles, by the way, so be on the lookout for them if you're curious about that sort of thing. Thanks for pointing this little known fact :). Ah, I love 1001 useless factoids. Oh, BTW, I mentioned some time ago that I re-used some of your Famicom scans (I retouched them in PS). Finally I got around to make my links section and added your blog, as a source. Just in case someone would want to know when they came from. Hey there, GameScanner! Thanks for the comment -- and for adding my blog as a source for your scans. Expect to see more soon, of course, and keep up the good work yourself!